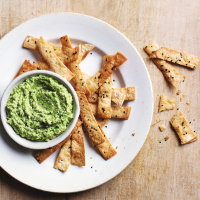 This is the ultimate dipping option, delicious served with quick crispbreads or chopped crudités. 1. Put the soya beans, shallot and garlic in a pan and pour in enough water to just cover. Bring to the boil, then reduce to a simmer for 4 minutes, until the shallot is tender. Drain and allow to cool slightly. 2. Tip into a food processor with the remaining ingredients and 3 tbsp water. Whizz for 2-3 minutes, until soft but with a little texture. Chill in a bowl until ready to serve. 3. For the crispbreads, preheat the oven to 180 ̊C, gas mark 4. Cut the wraps in half, then cut each half vertically into 5 strips. Toss in a bowl with the oil and 2-3 pinches of salt. Spread out on a baking tray, making sure they don’t overlap, and scatter with the sesame seeds. Bake for 15 minutes, until golden. Serve warm or at room temperature with the dip.